Kavanaugh: Democrats focus on healthcare, Republicans on record. 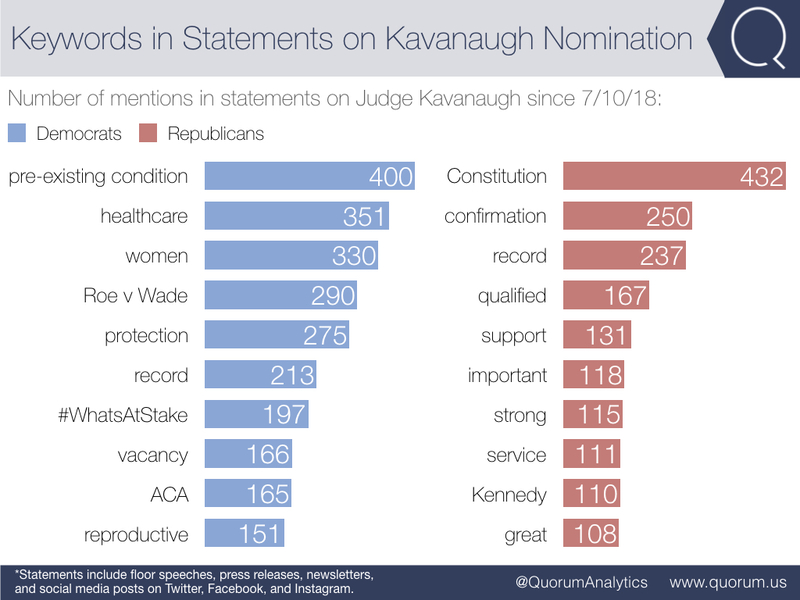 In the week of his nomination, Democrats mentioned Kavanaugh 1,368 statements to Republicans 1,084 statements. Democrats are leaning hard into healthcare with mentions of pre-existing condition, Roe v. Wade, and ACA all making the top ten keywords. Republicans are messaging Kavanaugh’s record with words like qualified, strong, service, and great. Gorsuch: Democrats focused on Garland, Republicans on constitution. 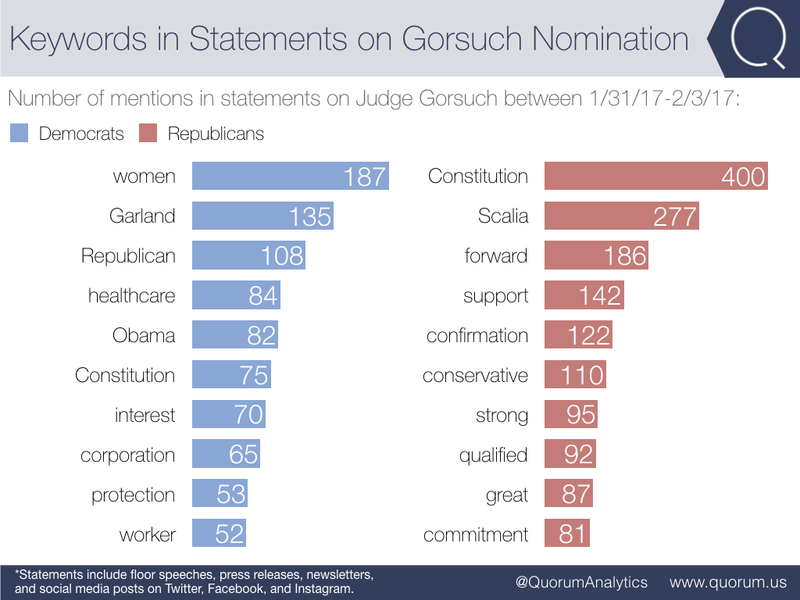 In the days following Judge Gorsuch’s nomination, Republicans released double the number of statements on the nominee as Democrats—1,044 to 504. Democrats message spanned healthcare, corporate interest, and the Republicans delayed nomination of Judge Garland. With Gorsuch filling the late Justice Scalia’s seat, Republicans focused on the constitution and conservatism. 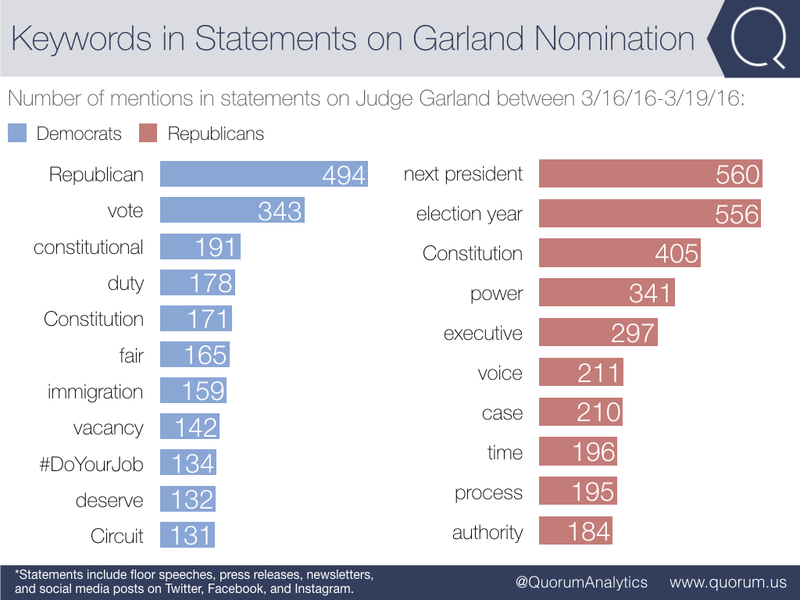 Garland: Democrats focused on Republican support, Republicans on delaying the nomination. As the minority party in the Senate, Democrats driving message following Garland’s nomination was calling on Republican support with keywords like constitutional duty, fair, deserve, and #DoYourJob. Across the aisle, Majority Leader McConnell (R-KY) spearheaded the message of delaying the nomination for the “next president” to decide.